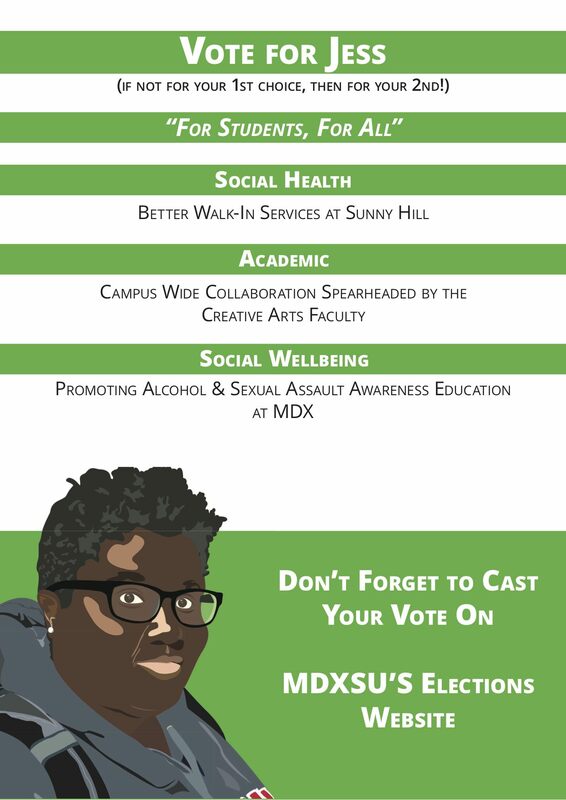 Middlesex Students' Union is led by elected student officers, who are voted into their positions by their fellow MDX students. Voting is now closed. Please click here to view the results, or scroll down to view the full list of candidates. Thank you to the thousands of students who voted, and congratulations to this year's candidates. Whether you were elected or not, you should be immensely proud of your hard work and your role in inspiring hundreds of your fellow students with your ideas for our University. The President and Vice Presidents are elected to work full-time to represent students at Middlesex University. they are paid an annual salary of £24,000 and lead the Students' Union work and campaigns. 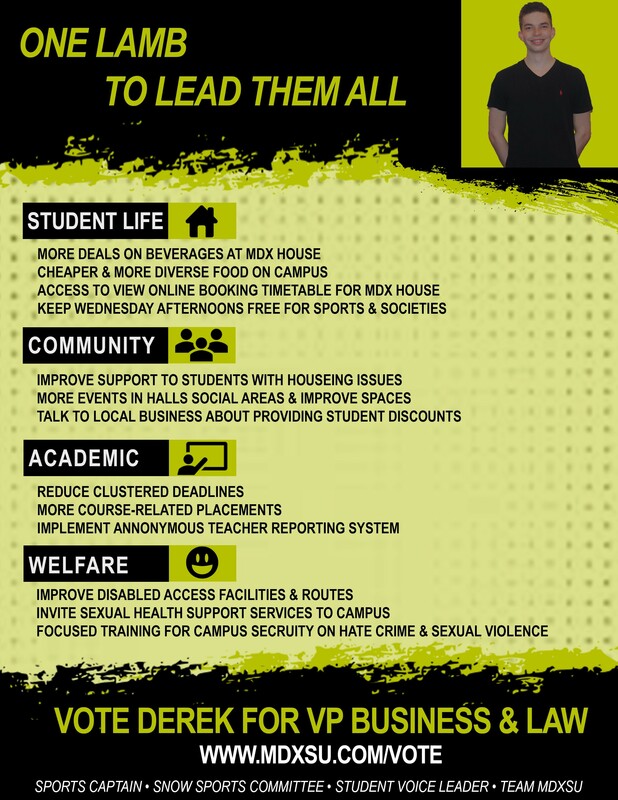 As student president, it will be my aim to ensure that all student's voices are heard. My motivation is simple; I believe in this university and through the collective work of the executive committee, staff and the students, we can continue with great progress that this university is making. Furthermore, I want to be remembered as a student president who pursued the wishes of the students and accomplished many great things. 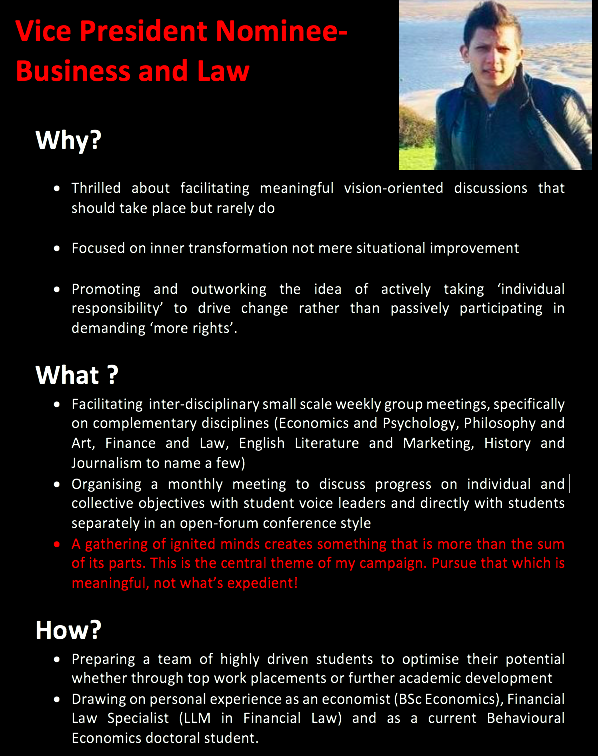 I will be willing to do anything within my power to achieve this as students are my main concern. As student’s president, I will bring leadership, commitment, and creativity to the role along with a strong work ethic and positive mental attitude. Over the next years, I want to see more power in the hands of the students, and this will be an underlying objective of any changes that I make over my term as a student president. Firstly, I will be raising the importance of workshop classes for second and third-year students; as I truly think students should get all the help and guidance they need with their assessments, in order to help them achieve the grades they need. Secondly, I will try and improve healthy diet options on campus, as there are only a few options at the moment, as well as having choices of religious dietary options. 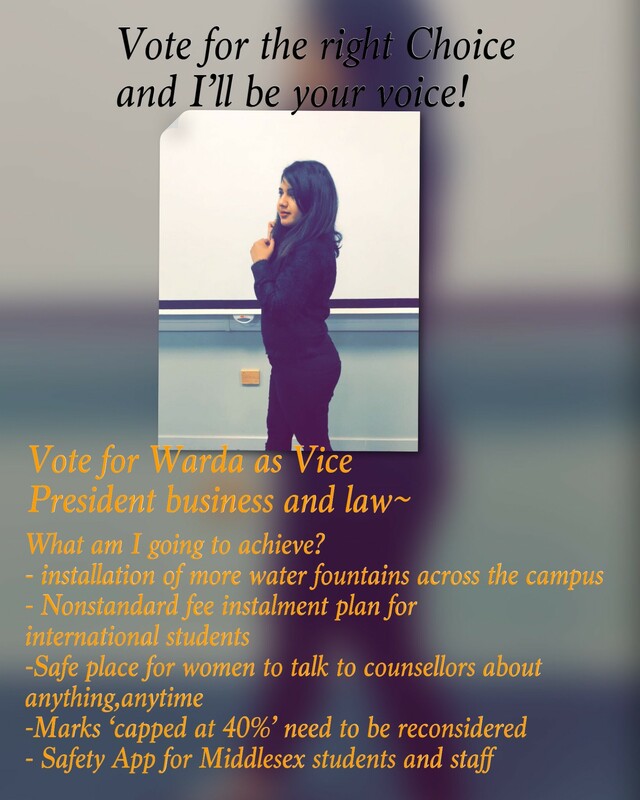 Please, support me and vote for me in the student president elections in order to achieve this. 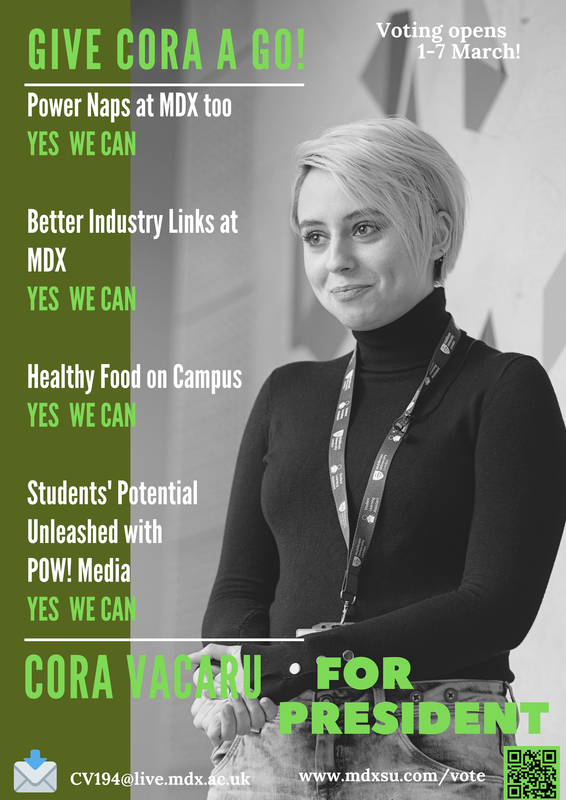 If you decide to vote for me, you will be choosing a leader who is dedicated, focused and committed to improving the lives of all students at this university. Module Leaders to respond to emails within 5 working days. 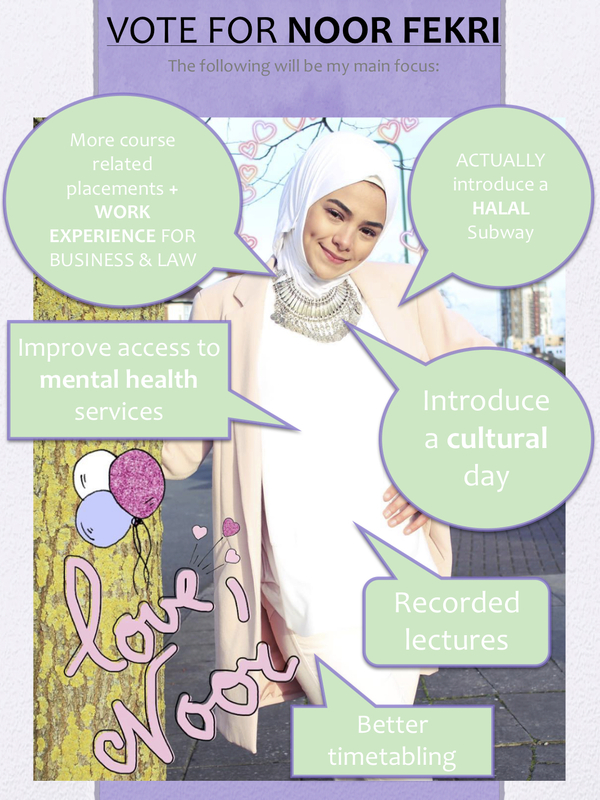 As President of MDXSU, I want to help continue the work of Ayah this year but continuing to tackle hate crimes on campus and sexual harassment (especially at socials and parties). I want to highlight the POW! Media sector and help students get the experience and knowledge required outside of lessons to get the job they want when they graduate and not just a dissertation - especially those creative students. Finally, I want to create more support networks and knowledge of the in-house mental health care university provides and more outlets for students to depend on because a lot of the time when speaking to students they don’t know about university’s support - as Student Voice Leader I have tried to spread the awareness of such help and encourage lecturers to voice such support as well as look out for at risk students. 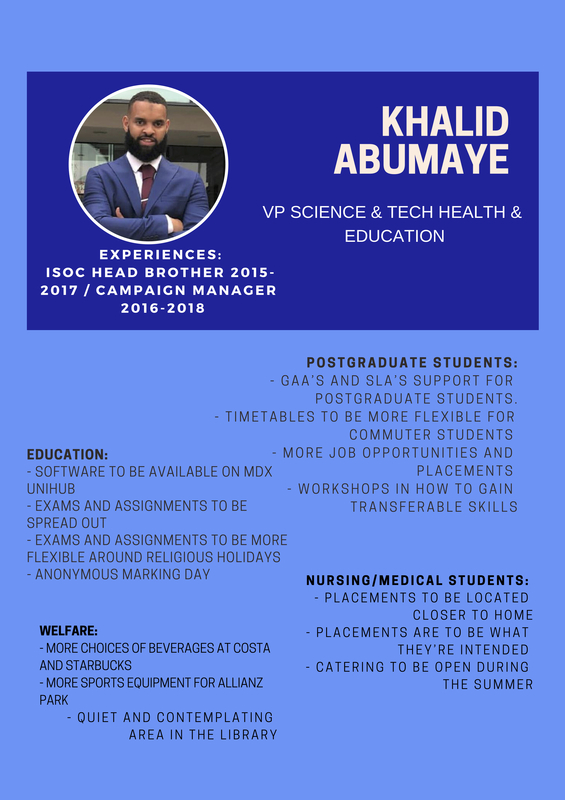 Let me start by thanking you for giving us your time to vote and to choose a president for the next term, who will be taking responsibility to deliver better services than what we as the student have received in the last couple of years. 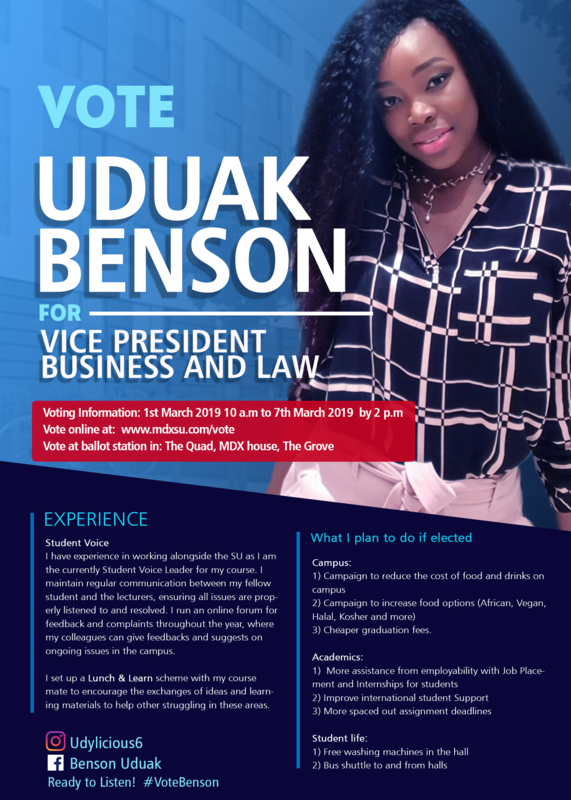 Vote for someone who has actual/practical work experience, I do not shy away from taking responsibility and to stand for the rights of the students. I will make sure to have more Halal varieties of food available at our university for students. The prayer room needs to be better managed and better facilities need to be provided. The room bookings for societies and is been a joke, it’s in need of some serious reforms and I’ll make sure to make it easy and more efficient for all of us. You deserve a better reward for the poor service you were receiving. It cost us £9000 each term and there must be accountability, the university been having it too easy. Let's not make it easy for them anymore. 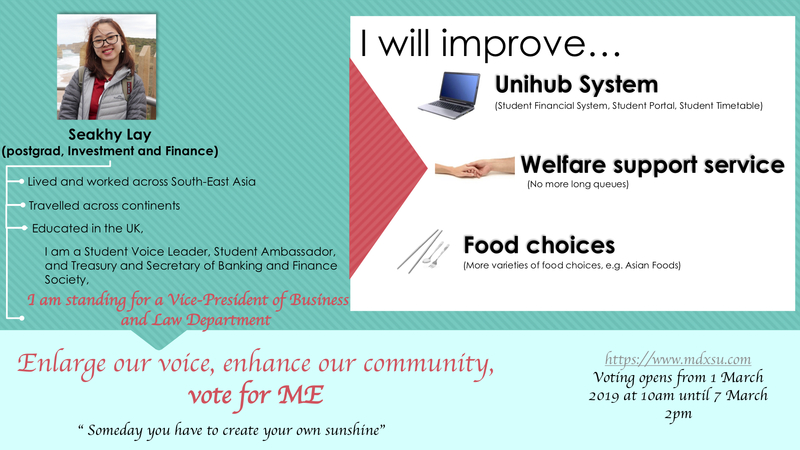 I have plans for every department of our university, please vote for me and count on me, give me a chance and I will make sure to deliver it. 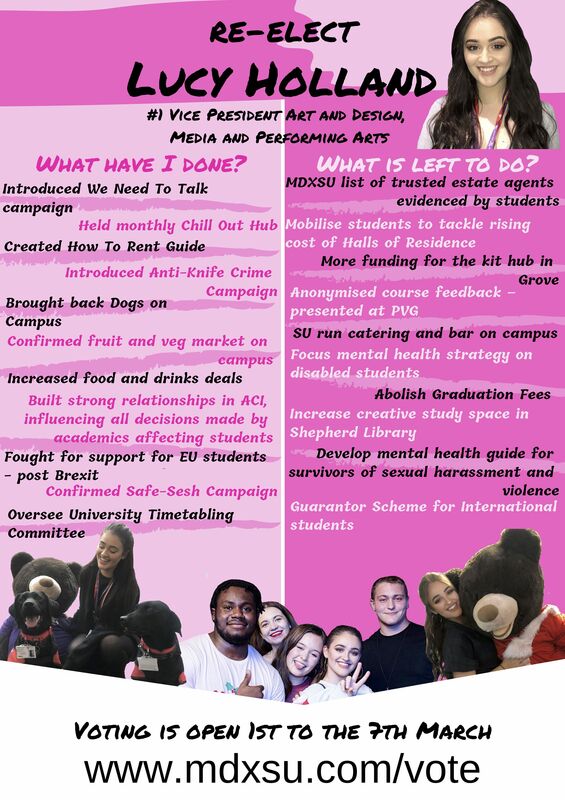 My name is Denisa Sivakumar and I'm running for the MDXSU President role. 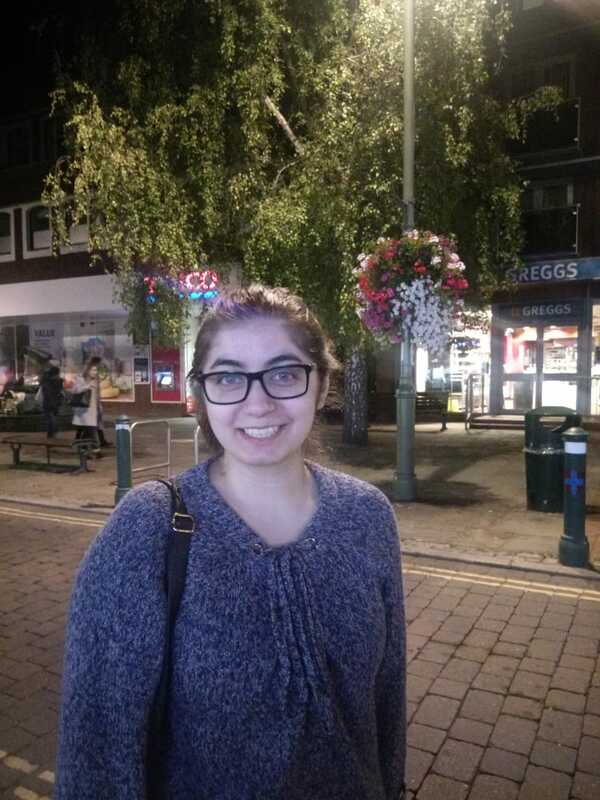 As a current final year student, I have experienced the life as a student and want to help the other students to enjoy their time at Middlesex too. 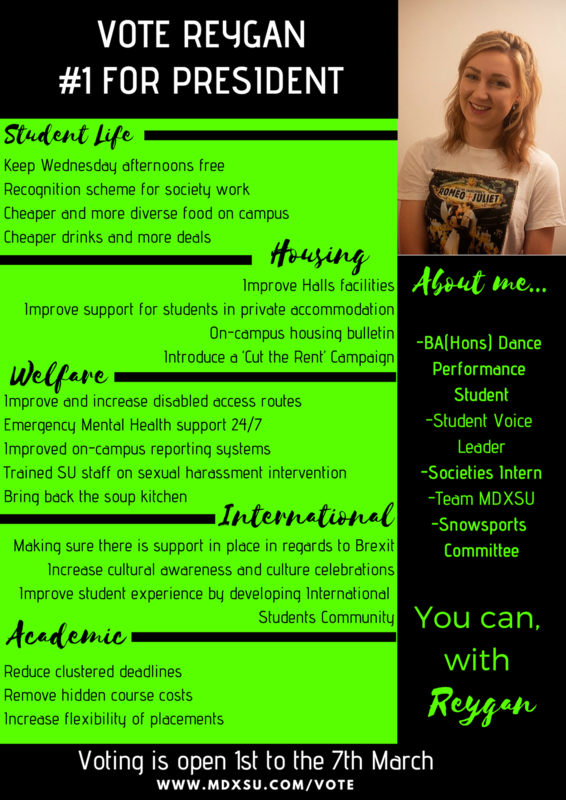 Being the president of the Erasmus und Exchange community in my final year I have taken the role to lead events but also bring in the awareness of our community to the students, for them to know that we are here to help in every possible way. I organised meetings and went to several meetings to hear and understand what students are looking for and make it possible within our community. 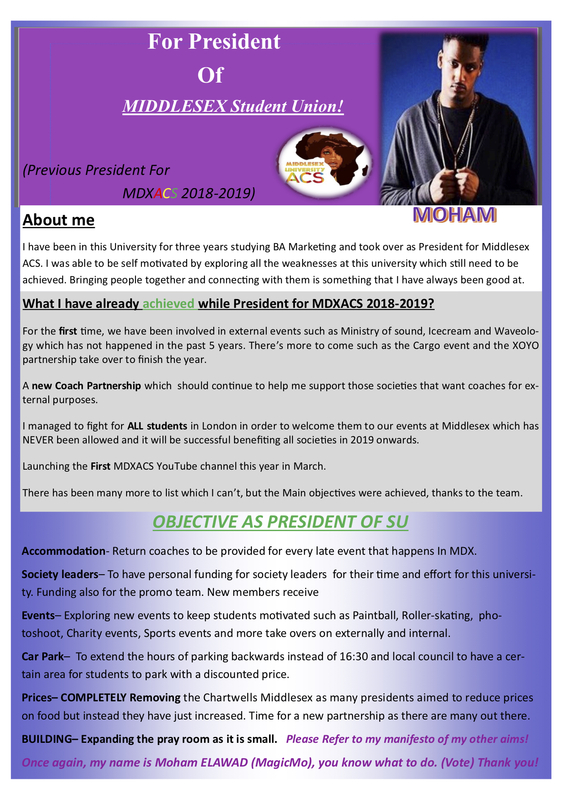 Being able to work with people who have the same interest is an amazing opportunity and as a MDXSU President it is something that I am looking forward to. 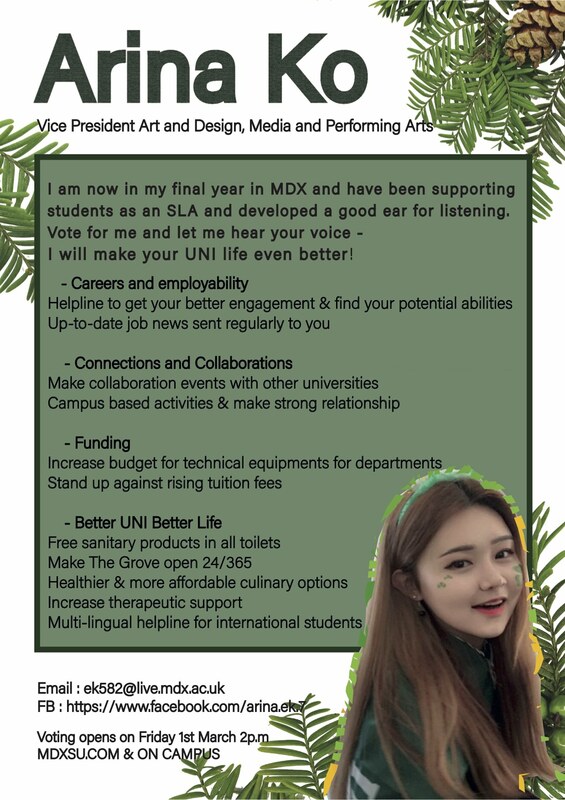 I want to become MDXSU President because I want to bring awareness about the possibility of a study abroad as I have realized not many students from Middlesex have thought or heard about that and studying abroad while at university is an opportunity one should not miss. 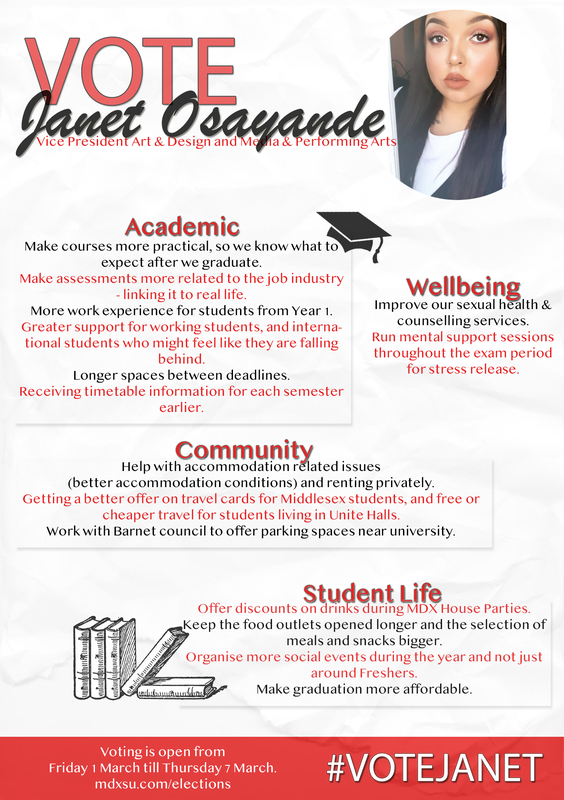 I also want better timetables for students, as there have been clashes with classes and sports activity. To enjoy their time at university one should also be able to join sports activity and the matches. I hope to provide an alumni event where organisations participate and explain requirements programs for graduates as that will help students for furture career plans. My name is Nawal ibrahim. I am a second year student currently studying neuroscience Bsc. I wish to run for the role of Vice President for Science and technology to make this university experience more accommodating for all. 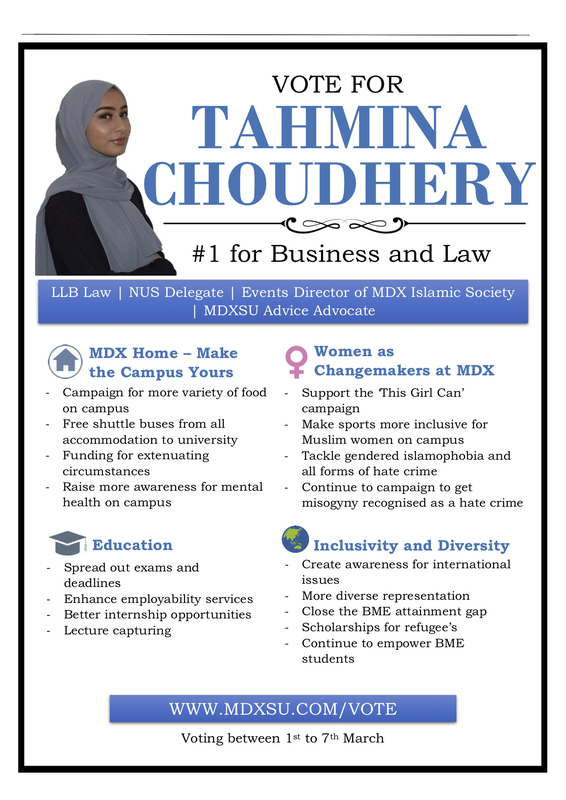 I am currently the president of the disability liberation group so due to this believe I can make the university better for all. Prior to university, I had experience as I ran as a prefect in both primary and secondary school and as a mentor in my college. What I plan to do if I get elected? 2. Build a university where science and technology students and staff can better work together . 5. 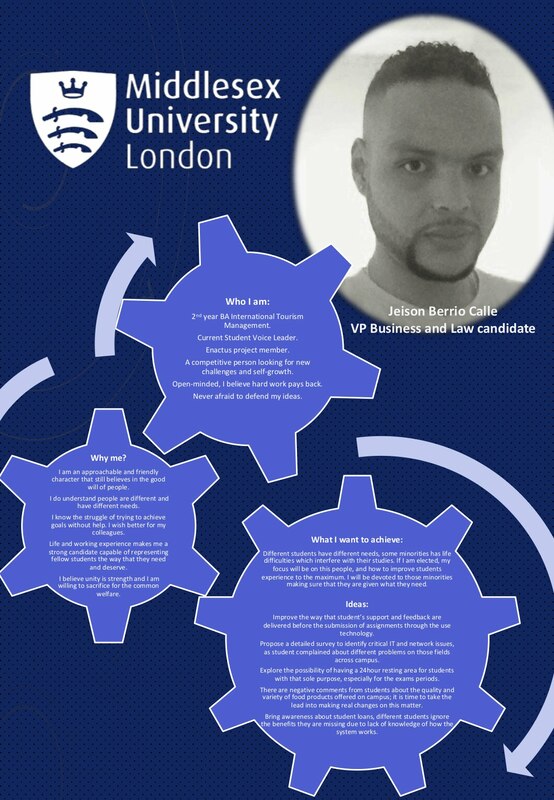 Work with the university to improve the punctuality and attendance policy. These are just some of the things I will do if and when I am elected. We don’t realize how important our university lives are for not only our future but also in building our personalities. As an international student I understand the difficulty of coming to new place and not having a clue of what to expect from this new life. I will urge the university to be more inclusive of people of different culture, race and religion to set an exemplary standard of diversity for others to follow. I will work with the faculty to provide better learning opportunities for which will help the students to recognize their individual core competencies. I will try my level best to lead you all from the front and work on finding solutions to any degree of problem. I will try my best to make you all happy. I will take care all of you with your problems. And many more. - Address the SU legislation in regards to societies and having a more thorough processfor resolving complicated situations like removal of committee members. 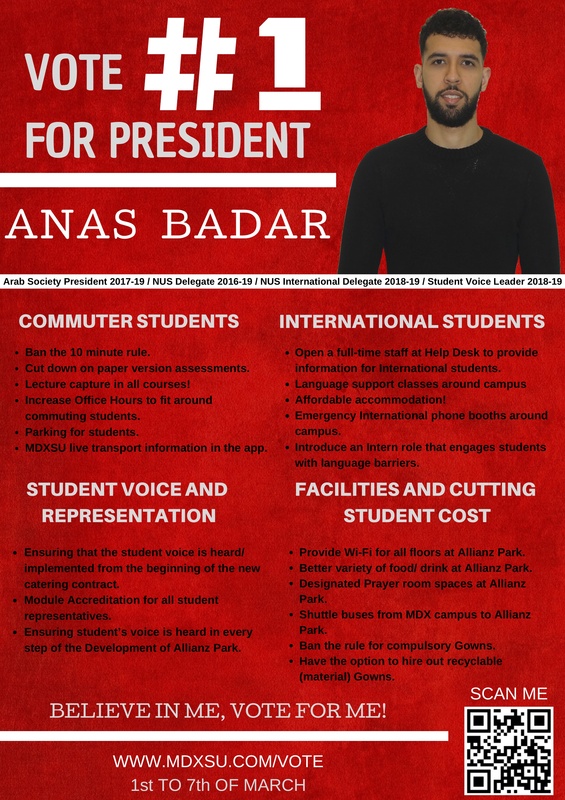 - Ensuring that the process of selecting student representatives are more thorough and provide a true reflection of what the student body wants. - Create a new role within the SU where there will always be a member of staff to listen to quieries, concerns, issues and ideas each day of the SU opening hours. 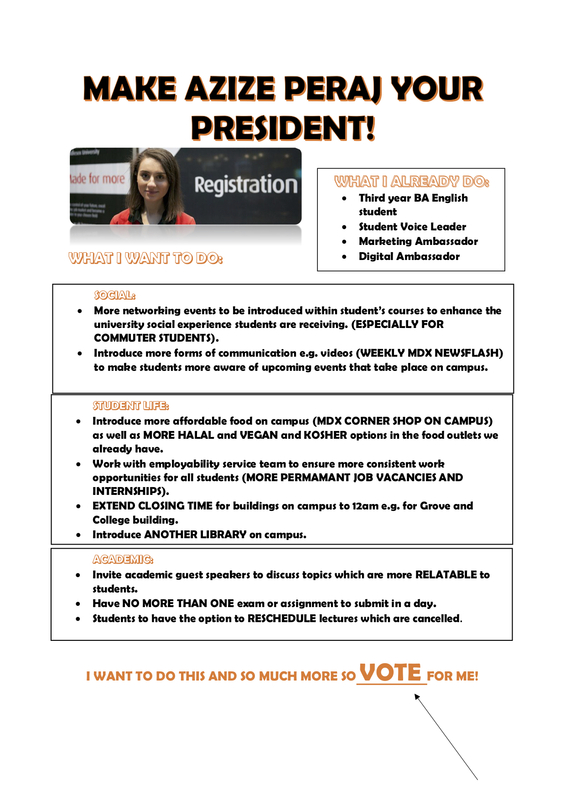 There are three Student Trustee positions available in this election. Student Trustees attend meetings, alongside the four full-time students Ofiicers and out expert trustees to discuss finances, strategy and long-term goals for your Students' Union.